Steamed buns have been my white whale. I've made them so many times and failed equally as many times. I've used different recipes, translated recipes from Chinese you tube videos, used different flours, different steamers. All of which turned into one big fail. To the point that my husband now calls it "The Steam Bun Incident" Dun, Dun, Dun!! I was traumatized, I traumatized my family and still did not yield any fluffy steam buns! But that was sooo 2017. This year, is the year. it's the year that Maangchi has made me see the light and allowed me to conquer my white whale: Red Bean Steamed Buns. And they have fun animal faces to boot! This is straight up Maangchi's recipe. It's awesome, pretty easy and delicious! My mom actually said it tastes like the ones you buy in the store. Uhhh.. score! However, I did not go through the process of making my own red bean filling. I bought a can of the good stuff. The Japanese stuff. The buns take long enough as it is (about 2.5 hours start to finish) So canned red beans are fine with me! But if you want to go through the trouble, Maanchi's site gives you details on that. Now onto the star of my show- dem buns! These buns start out with melted butter, which to me sounded weird. In all the chinese recipes I attempted, I don't recall any of them using melted butter. But I moved forward and though the technique was quite brilliant. 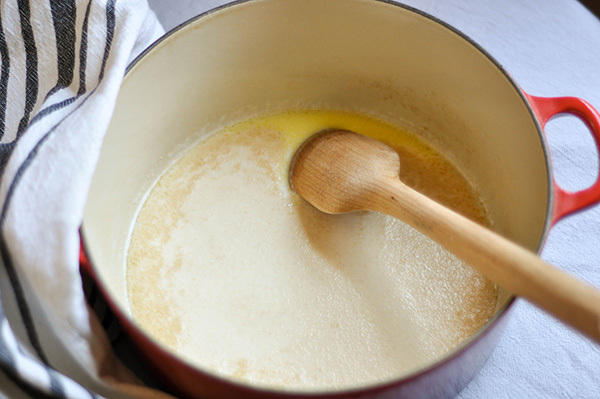 The heat of the melted butter is used to incorporate the sugar and then cold milk is added to lower the temperature of the butter to create conditions for happy yeast. No waiting for things to cool. Love that! Once the milk is incorporated, you add the yeast and let it bloom. Then in goes the flour and salt and thats basically it. You use your hand to knead the dough a bit. No crazy 10 minutes of kneading here. The dough will be sticky and soft. Don't worry, it's all good. Allow it to rise for an hour. Then punch it down, knead it a bit and it rests again for 30 minutes. Now it's ready to shape. Punch the dough down and turn it onto a floured surface. Knead it a bit to get it to a smooth consistency. Then divide the dough into 10-15 pieces. Remember the buns expand when steaming so they will puff up later. Shape each piece into a ball and flatten it out keeping the sides thinner than the middle, this is how to keep the buns even all the way around once the filling is added. Place 2 teaspoons of red bean paste into the center of the dough and pulling the dough on each side, gather it into the middle and twist to seal. Flip the bun so that the sealed side is on the bottom and place on a parchment lined steamer tray. Finish filling the rest of the buns and allow to rest for 30 minutes. While resting preheat the steamer by placing about 2 inches of water in the bottom of your pot and turn it on high. A good tip is also to wrap the cover of your steamer pot with a kitchen towel to help prevent condensed water from dripping down on the buns. Water on the buns creates a dimpled look and less fluffy bun. To make the animal faces, I reserved one piece of dough to color using gel food coloring and used black sesame seeds for the eyes. A tooth pick is very handy to use to help shape and place these decorative pieces of dough onto the buns. Once risen, lower the heat to medium high (a high heat also dimples the buns) place the steamer basket in the pot and steam for 12 minutes. Then turn down the heat to low and steam for another 3 minutes. Voila! Perfectly soft steamed buns. I'm so excited to share these buns with you. And thank Maangchi sooo much, for helping mer conquer this white whale, We can finally say that "The Steamed Bun Incident" of 2017 has its warm, steamy, fluffy bun ending! Yields 10-15 buns depending on how big you portion the dough. In a large heavy pot melt the butter. Once melted add the sugar and stir to combine. Pour the cold milk into the pot with the melted butter and sugar and stir to combine. Sprinkle on the yeast and allow to stand for 5 to 10 minutes to allow the yeast to bloom. Mix in the salt and slowly mix in the 3 1/2 cups of flour. The dough should be sticky and wet. You may not need all of the flour. Once mixed, knead with your hand to bring it together. The dough will stick to your hand but should come together into a loose ball. The drier the dough, the tougher the buns turn out. Cover the pot and allow to proof for 1 hour. 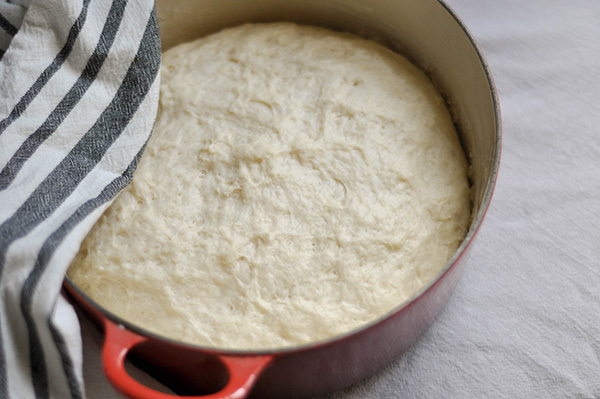 Once proofed, deflate and knead with your hand a couple of times, then allow to rest for 30 minutes. Sprinkle a board with flour and turn the dough out and knead till smooth. Then divide the dough into 10-12 equal balls. **If you want to make animal faces, reserve one pieces of dough to dye with food coloring. I used pink for the pig and pink and yellow for the chicken. Using your hands flatten each ball out making sure that the edges are thinner than the middle. 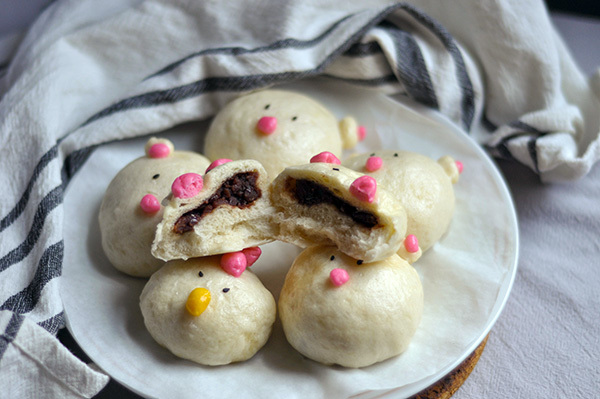 (This helps to keep the bun even around all sides of the filling) Place 2 tsp of red bean paste in the center, then bring all the sides into the center by pulling on opposite sides of the dough into the middle and sealing it. (It will look kind of like a soup dumpling) Turn this ball upside down and shape into a ball by cupping the sides of the bun. Place on a parchment lined steaming tray. Repeat with the remaining pieces of dough. Decorate if desired and allow to rise for 30 minutes. While the buns are rising, place 2 inches of water at the bottom of your steamer and turn into high heat. **Wrap the pot covers in kitchen towels to help catch the steam condensation and prevent the buns from dimpling while cooking! Once the buns have risen, place the trays into the steamer for 12 minutes at medium high heat. Then turn it down to low for 3 minutes. Once done, enjoy immediately. These are be frozen or refrigerated for up to a week. Steam again or place in the microwave covered with a damp paper towel for 15-25 seconds.